Location: Victoria and Albert Museum, London. Matthew 8:5-13 - When Jesus had entered Capernaum, a centurion came to him, asking for help. 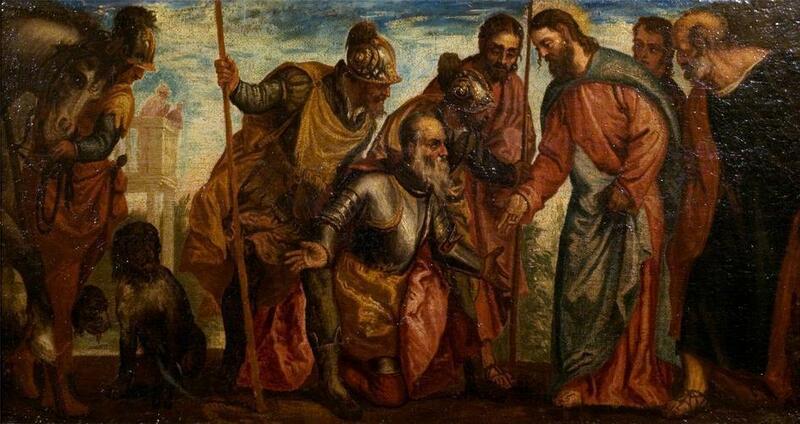 “Lord,” he said, “my servant lies at home paralyzed, suffering terribly.” Jesus said to him, “Shall I come and heal him?” The centurion replied, “Lord, I do not deserve to have you come under my roof. But just say the word, and my servant will be healed. For I myself am a man under authority, with soldiers under me. I tell this one, ‘Go,’ and he goes; and that one, ‘Come,’ and he comes. I say to my servant, ‘Do this,’ and he does it.” When Jesus heard this, he was amazed and said to those following him, “Truly I tell you, I have not found anyone in Israel with such great faith. I say to you that many will come from the east and the west, and will take their places at the feast with Abraham, Isaac and Jacob in the kingdom of heaven. But the subjects of the kingdom will be thrown outside, into the darkness, where there will be weeping and gnashing of teeth.” Then Jesus said to the centurion, “Go! Let it be done just as you believed it would.” And his servant was healed at that moment. The Gentile mission was at most peripheral to Jesus' earthly ministry: he did not actively seek out Gentiles for ministry. Therefore, the emphatic Greek "I" in 8:7 would place the emphasis in Jesus' question as: "Shall I come and heal him?" Most Palestinian Jews, after all, considered entering Gentile homes questionable: an outsider who would entreat his favor must first acknowledge the privilege of Israel, whom other peoples had oppressed or disregarded. Such initial rejection was a not uncommon ploy for demanding greater commitment, and rather than protesting, the centurion acknowledges his questionable merit before Jesus, adopting the appropriate role of a suppliant totally dependent on a patron's benefaction.